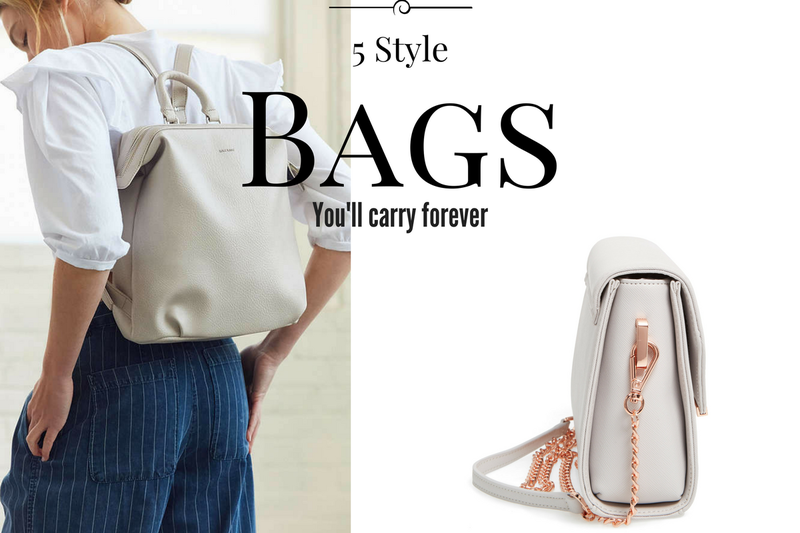 5 Style Bags You’ll Carry Forever! As women, our handbags are one of our best friends. We need something that fits our style, perfect for each occasion, and reliably long lasting to be by our side. Although handbag styles have drastically changed as a woman’s accessory, there are certain shapes and silhouettes that remain part of the handbag repertoire, and for good reason. These bags are known to be a girl’s best friend. From small purses to oversized shoppers, there’s always a silhouette to fit your ever-changing needs. Women are multitasking creatures, and our purses should do the same. But it is okay to have more than just one (or ten for that matter). When you find a good one, it’s hard to say let go. A go to for the on-the-go kind of girl. Choose a fold over clutch for more casual and easy style, an envelope clutch for a clean cut look or play with colors and textures to make it the perfect girl’s night out accessory. For hands free, simple style a cross body is cool, convenient and allows you to keep your things close by (a necessity in any big city, especially Paris). A festival must-have but also a great weekend bag to tag along. A handbag that can take you from the office to a dinner date, with clean lines, classic colors and textures, the satchel is a reliable yet chic piece to complete your day to night look. When you’re in need of a carry-all kind of bag, a tote is usually the safest option. It will without a doubt hold your umbrella, books, camera, make-up bag, wallet and just about anything else you want to “tote” along with you. We all have one, and if you don’t then you certainly need one; the everlasting, goes with everything bag that is extremely versatile. Try a leather backpack or my personal favorite, Longchamp’s Le Pliage nylon tote. It folds down to small square, is waterproof, spacious and without a doubt a fit for every outfit. Previous Post Best Dresses to Wear to a Summer 2017 Wedding! I am in total agreement with this list. I can never get enough cross body bags and clutches. Lol! Great picks! I don’t think I’d ever stop wearing cross bodys, they’re definitely my favorite! There all so cute especially excited about the Vegan leather! Hi! I’m so glad you visited my blog…it’s been a while since I stopped by yours too. Your photos are amazing! You are right! Thanks for the perfect recommendations! Love all the bags of this selection ! I love sling bags because they are cute and easy to carry. but a girl should have at least one of each these types! Loving your choices so much darling, great selection!! Amazing picks, Darling! Love them all! Thanks for sharing! I love the all! Good job! I like this. Very uniqueness design. I am very impress from this bags. Great blog!